Alex May is a British artist exploring a wide range of digital technologies, most notably video projection onto physical objects (building on the technique known as video mapping or projection mapping by using his own bespoke software), also interactive installations, generative works, full-size humanoid robots, performance, and video art. Alex is head of Projective Geometry at The Institute of Unnecessary Research. Working with digital mediums and technologies is well recognised as offering a wide range of exciting and creatively challenging possibilities for the arts. The amount and quality of free and commercial tools that are available is staggering, and I have seen all this transpire since growing up as a pre-digital child in the 70’s. Fortunately this hardship only lasted until the early 80’s when Sir Clive Sinclair released his first affordable home computers onto the UK market. When I started teaching myself programming at around the age of seven, I was instantly enamoured with code and the audio/visual aesthetics of its tiny internal domain. It did exactly what it was told, even if that was to accidentally crash the computer (taking all your work with it), and it offered a complex world of exploration to a generation of eager young minds. That formative experience has been crucial to forming my artistic practice today. While I can’t imagine what it’s like to be that young today having been brought up with Google, Wikipedia, and Facebook from birth, the introduction of small form computer platforms such as the Arduino, Raspberry Pi, and BBC micro:bit, combined with the way programming is taught seems to be aiming to recreate the experience of the 80’s. This situation sums up the duality of digital to be both highly enabling, including creatively, while being exponentially opaque when one starts looking behind the screen at the internal workings. In turn, this is where we find many digital artists able to work successfully in a post-modernist manner, while never having written a single line of code. 1) You give up control of the code. Every few weeks it seems that some automatic update comes out for OSX, or Google retires another service, or Twitter changes its terms of service, or a programming library that other applications depend on decides to change or refactor itself and suddenly your workflow or your digital artwork suddenly stops working and there is often little recourse available to you. It is an unobvious choice to base digital art on such shifting platforms and expect profit driven companies to care about the longevity of your work. Computer hardware and software manufacturers are not interested in building you a computer that would last for your whole life, or beyond. 2) You don’t understand the underlying processes. To code is to understand how technology actually works, with all its frustrations and limitations. Does a painter or sculptor who works with their chosen materials hands-on become informed by the properties and methods over time? Personally I would say so, and I apply the same logic to creating art in code. It is this second reason where I have drawn inspiration for many of my artworks. Sometimes I have a very specific goal in mind, which becomes a fairly linear process of working towards that end. 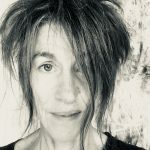 Other times I might find some interesting side effect or by-product of a technology and create works that explore them. An example of the former would be the interactive piece “Shadows of Light” that I recently showed most recently as part of my “International Visiting Artist” solo exhibition at the University of Calgary in Canada. It explores the concept of ‘slow interaction’ as a counterpoint to the great many interactive works that require visitors to wave their arms about to trigger effects. In this case, visitors need to stand completely still for several seconds before Shadows of Light slowly takes their silhouette and uses it akin to a spray paint stencil; your shadow appears on the projection in front of you. The longer you spend looking at the artwork, the more ‘paint’ is applied, causing it to start dripping down the screen and bleeding into the shadows of the previous visitors. The work gently encourages the viewer to spend time with the work as a piece of art rather than go for digital spectacle. An intriguing aspect of the work is that it doesn’t show anything (just a black screen) until someone stands in front of it; the act of viewing creates the art, leading to the work being a record of everyone who has stood in front of it during its exhibition. I enjoy this piece because for me it embodies the principle of a piece of art being a mirror to aspects of our humanity, rather than a clever technical demonstration. While its creation required me to spend two long weeks arduously manipulating floating point numbers by tiny amounts to obtain just the right amount of ‘drippyness’ and dictate how quickly the ‘paint’ dries, the final piece doesn’t speak about that process. 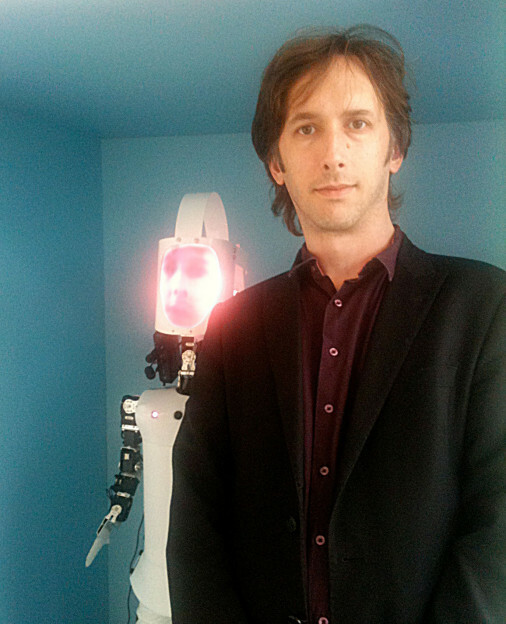 The “My Robot Companion” project was originally commissioned by the Science Gallery in Dublin in 2011 as the first major outcome of Anna Dumitriu and I being awarded Visiting Research Fellow: Artist in Residence positions with the computer science department at the University of Hertfordshire. 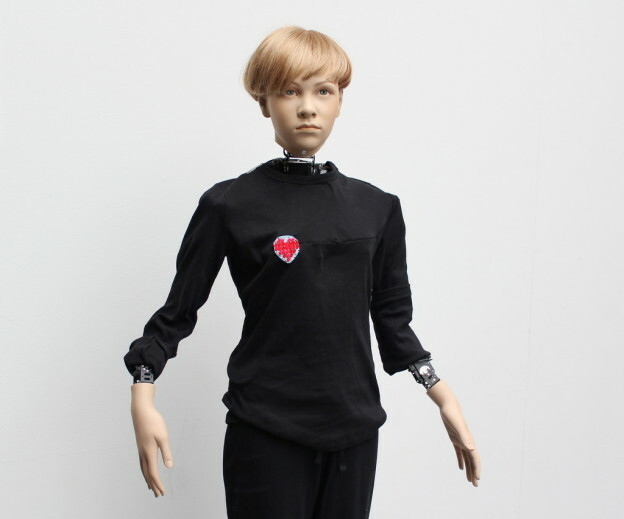 In its current iteration we have a full size humanoid robot called HARR1 (Humanoid Art Research Robot #1) that has motorised neck and arms, and can interact with people in a variety of ways. Currently we have HARR1 exhibiting boredom, so when people stand in front of it expecting to be entertained, it will look them in the eye (it has a camera in its chest that is used to follow people’s positions) and then look away distractedly. While relatively simple, the interaction has a surprisingly powerful effect on visitors, who seem quite challenged by the experience of the unexpected role reversal. It also highlights some of the very real issues that creating robots designed for being embedded in social situations face, which has been an important area of research for Hertfordshire. While we may be promised the idea of robots in the home (since the 50’s! ), we will have to deal with such perceived emotional responses that leave us feeling uncomfortable in our own living room. Rather than use the existing library of robot control code, I started absolutely from scratch; sending serial commands to each motor to control their positions. This way I quickly learnt that the physical abilities of the motors were far more variable than I expected. The transition from the digital realm where numbers can be calculated with a very high degree of accuracy, to the physical realm where you’re not really sure if the motor that you just told to rotate by ninety degrees will ever get there (perhaps it’s carrying too much weight, perhaps it overheats! ), is a wonderfully frustrating boundary to work across. 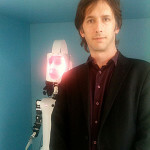 It was a unique experience for me when, during a week long residency at Hertfordshire’s secret robot house (yes, really) we programmed HARR1 to slowly reach out and touch the face of the person sitting in front of it. By using conductive thread sewn into the fingertips of a pair of gloves, we could detect when the gloves touched both sides of a face (causing a circuit) at which point we would stop the movement. It was the first time I had been physically touched by my own code. 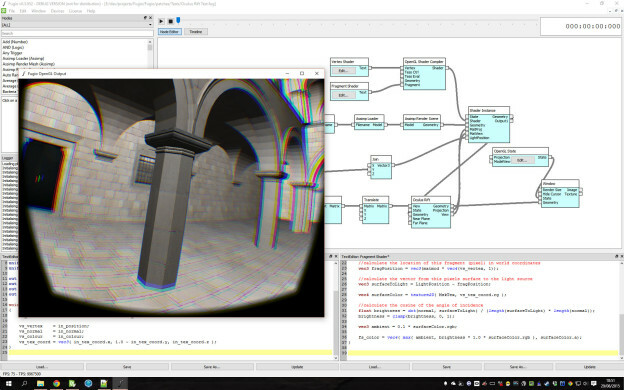 Having spent a great deal of my life learning and actively doing programming, it seems only right to me that I should attempt to share some of the tools that I have created so that other artists may benefit from them without all the arduous coding and debugging. 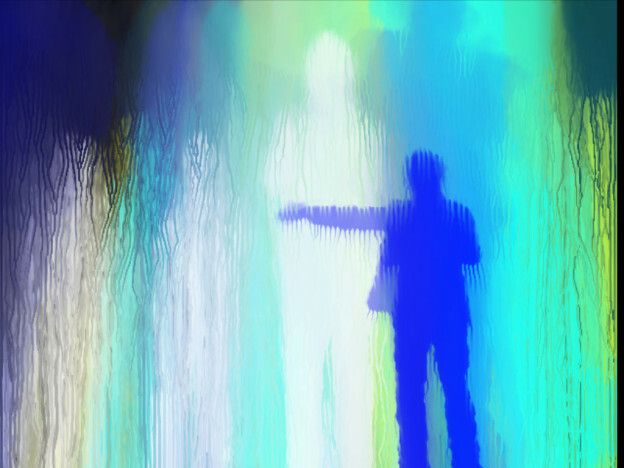 In 2012 I released “Painting With Light”, which is a video mapping software application aimed at artists. Video mapping (also known as projection mapping) is a technique where a video projector is used to project over multiple 3d objects, rather than a single flat screen. The software allows the user to playback multiple video files simultaneously and – critically – adjust their position so that they line up with the physical shapes, making it appear that many projectors are being used at the same time. 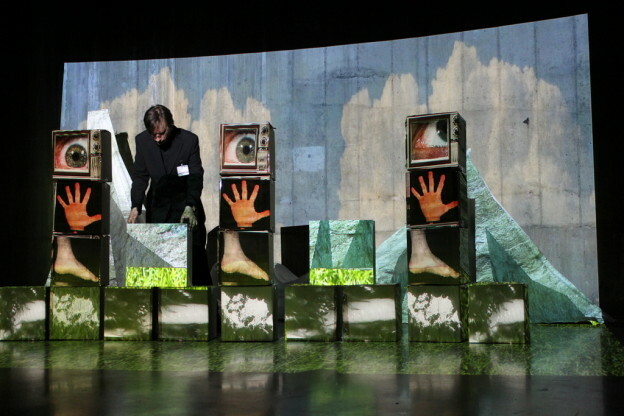 It is the only video mapping software that incorporates tools for experimental live performance. Designed for people with no previous knowledge or experience, it has been well received, and I am very honoured to be invited to countries around the world to give talks and workshops. I have used it for a live 75-minute performance in the South Tank at Tate Modern in 2013, where I built up a stage of cardboard boxes and sheets that I then mapped video onto, creating an evolving narrative. More recently, I have created a piece at Level 39 in One Canada Square, Canary Wharf in London, called “No Violence To The Sky”, which responds to the writing of the buildings architect César Pelli, in which he discusses the complex relationship between buildings, their environment, the people in and around them, and the challenge of balancing all of these factors into a final design that do not cause a “violence to their place”. 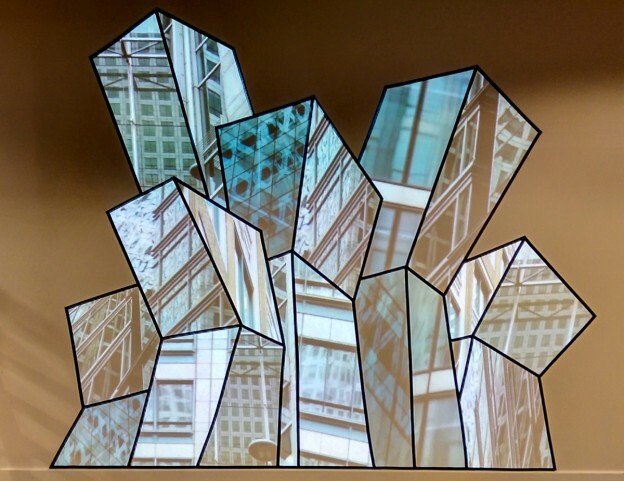 The projected video sculpture presents the publicly viewable external architecture of One Canada Square not directly, but as it can be seen reflected in the buildings and environment that surround it; an indirect (and sometimes distorted to the point of abstraction) secondary architecture that is evolving over time as new buildings and features are built in its surrounding area. I’m very excited to be gearing up for the public release of my new digital art platform that I’ve been furiously and solitarily working on over the past couple of years. Called “Fugio” (foo-gee-oh), it is a cutting edge programming system that doesn’t require you to write any code (although you can if you want to! ), rather it uses a visual interface to add rectangular nodes, which contain pre-written code, and join them together to create complex interactive digital artworks. In principle, it’s not unlike systems such as Max/MSP, Quartz Composer, vvvv, PD, but it has been designed for the needs of artists; specifically it is designed to make it exponentially quicker to prototype and build creative ideas, while teaching transferrable knowledge, and importantly, address the myriad issues around preservation of working digital artworks beyond a short period. To fully commit to the latter, and after much deliberation, I have made the decision to release Fugio open-source. While this means I won’t make a penny on software sales, I strongly believe that artists need open tools that can be supported and extended by many people, and not be tied down to the design choices and feature list whims of profit driven organisations. I have not instigated a large open-source project before, and the idea of anyone being able to pour over my previously hidden code and (no doubt) find stupid bugs and (hopefully rare) poor design choices, is both terrifying and invigorating. Additionally, as I have used so much open-source software over the years, I feel a (welcome) responsibility to give something back. Code is not just a creative muse; it demands attention on many levels of your life, and dictates you force your brain to think entirely logically (for better and worse). A life of programming changes your approach to many things, but the art reminds us that while these systems are complex – perhaps beyond the understanding of any one person now – they too are a mirror to ourselves, made not in our physical image, but an invented mental process, scaled up to the point of almost magical ability; a monument to our ingenuity; an on-going conversation that we are all entitled to be involved with. To my mind, only art holds the tools that we need to understand and relate to its true nature.